Another one of the opportunities I've taken this year has been a 5 day course about teaching science in the upper primary years. The course was co-run by the amazing Australian Science and Mathematics School (ASMS) and the Department of Education and Child Development. The ASMS is a senior high school based at Flinders University of South Australia (my alma mater - woot woot) and which, clearly from its name, focusses on Science and Maths ed. The school is right on the FUSA campus and has amazing learning spaces. Everytime we went there I came away just buzzing with ideas for our learning spaces. Anyway… I digress. (Something new? Not.) The course was open (through application) to teachers of year 6 and/or 7. Preference was given to applicants who applied in tandem or groups of teachers from one school. I applied with two of the other teachers from my unit and we were all successful. The course was taught by staff from the ASMS and focussed on the Australian Curriculum strand of Science as a Human Endeavour and developing participants' skills in teaching from an inquiry position. Much of our time was spent learning through activity: plenty of 'take home' hands-on learning experiences. You can imagine how the little groups of teachers from different schools all buzzed with ideas building on each activity. I've no idea how the trainers managed to get through everything on their agenda - we were a rather rowdy class! The structure that the trainers were keen to impress upon us as best practice is one that I remember well from uni: the 5Es Teaching and Learning Model. Have you ever used it? 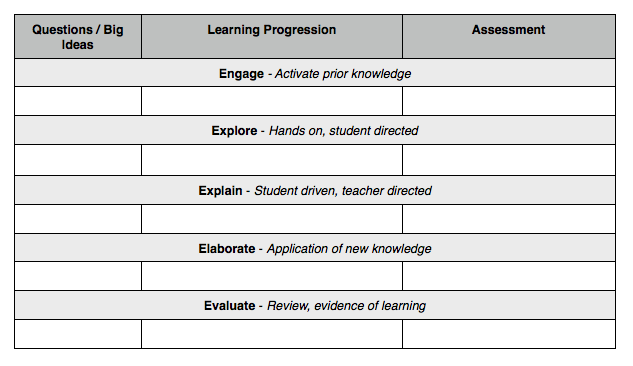 It's a strong scaffold around which to build a learning progression. Engage: capture students' interest and activate prior knowledge. Explore: hands on activities that are student directed and force them to collaboratively wrestle with a new problem or set of ideas. Explain: teacher provides conceptual clarification for ideas developed during the exploration. Important that this happens after the exploration, but it's ok to cycle back and forth between the two. Elaborate: collaborative application of new knowledge. Evaluate: review; evidence of learning. It's important to remember too that each stage in this progression can, indeed should, have assessment built in - either for, of or as learning. Hearing a broad range of assessment methods was thought provoking. And a little affirming. Our team all uses a really broad range of assessment strategies across for, of and as learning. My commitment to action from that session: get students to self and authentically peer assess much more often than I currently do. The next part of the course involved developing an inquiry unit of teaching and learning to deliver to our classes. We then came back together to discuss our progress. Now, I'm going to let you in on a little secret that I'm sure my colleagues won't mind me sharing… We came up with the draft of our unit in about an hour. A big part of our hour was spent formatting this pro forma. Shhhh! And then finished putting together the unit in another hour AND then taught the majority of it in two days. (They were full days - dedicated to science.) It's not ideal but you know what? We learnt a lot about how we need NOT to plan in future and the four classes in our unit learnt a LOT about electrical circuits. It might have seemed like it was a rush job to put together and teach but I think a more accurate description is that we pulled together as a team and worked incredibly well and incredibly collaboratively. The five day course was an interesting process for me. Occasionally I felt a little frustrated because the 5E model was presented almost like a new concept and it's not. (Certainly not to anyone who's finished uni in the past 5 years.) However, looking around the room I remembered that most of the people there finished before then although most of them had worked with the model before anyway. I guess it was my expectation that I'd learn more NEW models? That being said it was a good chance to review the model. I enjoyed looking at science (as a subject) through the lens of the Science as a Human Endeavour strand. I don't think many of us do it very well yet. I certainly don't. It comes across in various aspects of my programme but rarely as part of my science programme. I need to work on that. Stay tuned for a wrap up of our unit of teaching and learning about electrical circuits.